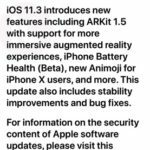 According to the latest Sensor Tower Store Intelligence data, over 13 million downloads of augmented reality apps built entirely using Apple’s ARKit framework have been observed in the first 6 months of ARKit’s release. The data also shows that these installs were led by Games, with share of ARKit-only game downloads growing substantially from 35% to 47%. 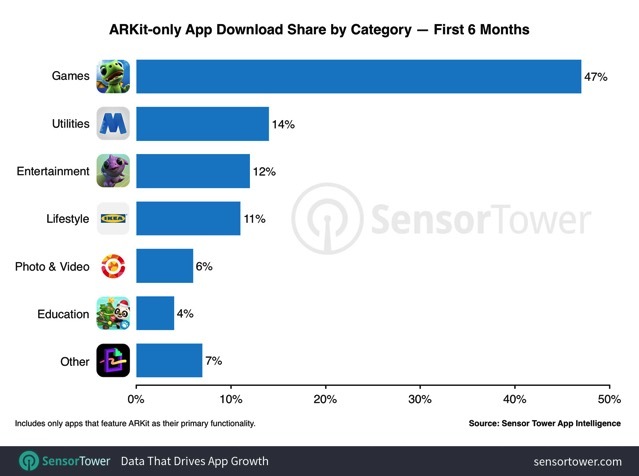 The chart shown above shows the top 10 rankings of the most downloaded free and paid ARKit-only apps and games, along with the highest grossing offerings so far. The share of downloads coming from second-place Utilities has decreased from 19% to 15%, whereas Lifestyle has more than doubled its share from 5% to 11% in the past half-year. 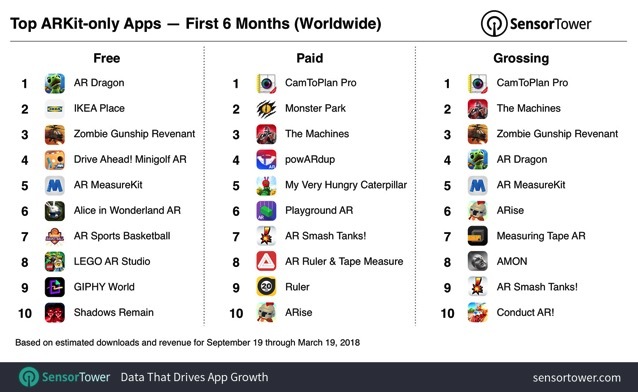 PlaySide Studios’ AR Dragon has lead the downloads among ARKit-only apps for the duration of the framework’s first six months of availability. For more information on downloads and ARKit-only app rankings, check out the source page.